11/4 shot Pilaster landed the £300,000 G2 Qatar Lillie Langtry Stakes, surviving a stewards' enquiry to triumph in the 14-furlong event. Trained by Roger Varian and ridden by David Egan, the three-year-old daughter of Nathaniel engaged in a thrilling battle in the closing stages of the G2 event with 16/1 chance Maid Up, trained by Andrew Balding and partnered by Rob Hornby. Pilaster responded willingly to Egan's urgings to regain the lead close home and score by a short-head. Pilaster raced just once as a two-year-old, finishing seventh in a Doncaster mile maiden in October. The Cheveley Park Stud-owned homebred won both of her starts in novice events on the All-Weather at Chelmsford (1m 2f) and Kempton (1m 4f) this year with Newmarket handler Varian describing her as a "classy" filly. He said: "Watching it live and watching again, I did not think Pilaster was loving the ground. I think she has overcome the ground. She is class and all guts - she got headed and came back to win on the line. She is a very classy filly. She was very good today. She showed a real toughness today as she was headed and came back. "Hopefully, she comes out of this race well and then we would have to consider races like the QIPCO Fillies & Mares at Ascot on QIPCO Champion Stakes in October or the Park Hill at Doncaster before that. I think Pilaster will really come into her own when she is racing on slower ground. She has been doing her racing on the All-Weather so far this year and and I think there is more to come. "The ground today was in good condition, but I was glad when we got the rain. She is very enthusiastic in a sensible way and has a big will to win. She is not over exuberant. It's great for the team at home. We've had a good year, but I felt we needed a big winner at one of the big meetings, so it's great to get this one on the board. Hopefully, this will propel us onto the second half of the season. The form of Pilaster's two All-Weather wins had worked out well and she looked quite classy at home. "These classy animals are horses that you can't rush and you have to take your time with them. She is a late maturing type who will only get better with what she showed today." I thought David [Egan, jockey] was very good on her. David has always stood out. He is very young but is as classy as the filly is. He did not panic and held her together. I thought he gave her a beautiful ride. David is so balanced in the saddle and he has an old head on young shoulders. 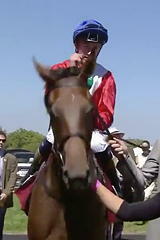 I'm delighted for him and for Cheveley Park who are big supporters. I'm glad this filly has won for them." Established in 2003, the 14-furlong race for fillies and mares became a G3 in 2004 and promoted to G2 status in 2018.